Statue at Lakeview Cemetery in Seattle, where Madame Damnable is buried. By Steve Mohundro on Flickr, Creative Commons license. I wrote a few articles in preparation for the release of Rest in Pieces, but the one I most enjoyed was about a nineteenth century Seattle madame, Mother Damnable, whose corpse is said to have turned to stone. Mother D (also known as Mary Ann Boyer or Mary Ann Conklin) has been fascinating me for a few years, and I’m glad to have had a chance to tell some of her story. Read it at The Stranger. I’d like to thank John LaMont, Special Collections librarian at the Seattle Public Library, for his help tracking down key documents for the story. John provided me with the 1884 article that describes the discovery of Mother Damnable’s corpse, which I’m including below. “Removing the Dead.” August 22, 1884. The Seattle Post-Intelligencer. A reporter of the Post-Intelligencer called upon Mr. O.C. Shorey, the contractor for removing bodies, monuments and stone work from the old city cemetery to the new burying ground, adjoining the Masonic cemetery, and asked him for anything of interest in connection therewith that has so far come under his observation. Mr. Shorey said: “I have been at work about three weeks, and have removed so far 120 bodies together with most of the monuments and stone work, and have, I think, over half of the work done. I have been laying off for a few days, waiting for the Catholics to get their grounds in readiness for the reception of the bodies of those of that faith. I have also delayed some in order to give all friends of deceased persons an opportunity to select new lots, and to give all such friends an opportunity to be present during the removal of the remains of their friends and loved ones. “Last week among the remains taken up and removed were those of Mrs. Mary Conklin, who died and was buried eleven years ago, at the age of 70 years and 10 months. During her life she was known by the old settlers as ‘Mother Damnable,’ and many will remember her by that name. We discovered that the coffin was very heavy, weighing at least 400 pounds and it took six men to lift it out of the grave. 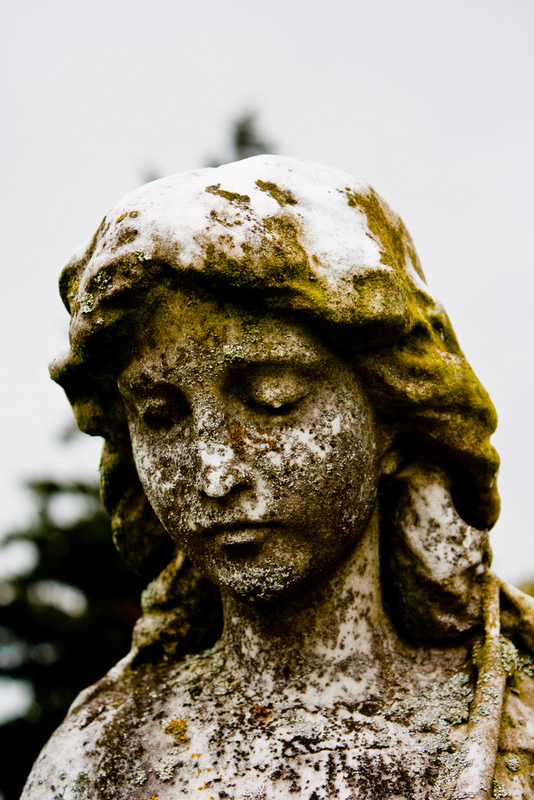 On removing the lid to the coffin we found that she had turned to stone. Her form was full sized and perfect, the ears, finger nails and hair being all intact. Her features were, however, somewhat disfigured. Covering the body was a dark dust, but after that was removed the form was as white as marble and as hard as stone. When we took up the coffin under the headstone marked “William Carnes,” who will be remembered as a large butcher, who died some ten years ago, we found the form of a small, delicate woman, with her clothing on and watchchain about her neck. The way I account for this is as follows: Some time after Carnes died, his friends had a stone made to mark his grave, and the parties employed to set the stone placed it over the wrong grave. When the remains of James McKay, the tanner, who died ten or eleven years ago, were taken up, they were found well preserved, though the features were unrecognizable. All the graves, at certain seasons of the year, are full of water and the coffins float in their boxes. The action of the water has turned most of the bodies black. In a greater number of the coffins there is nothing but a few bones. The coffins are mostly sound, and before removing them we place them in new cedar boxes. So far we have found nothing of an offensive nature so far as smell is concerned, most of the bodies having been buried so long that the flesh has either all turned to dust or been eaten by the worms. I shall take up and remove all the bodies that can be found, including those who sleep in unmarked graves within the Pottersfield, but shall not interfere with the Chinese graves, as the Chinamen desire to take up the bones of their dead and ship them to the Flowery Kingdom.